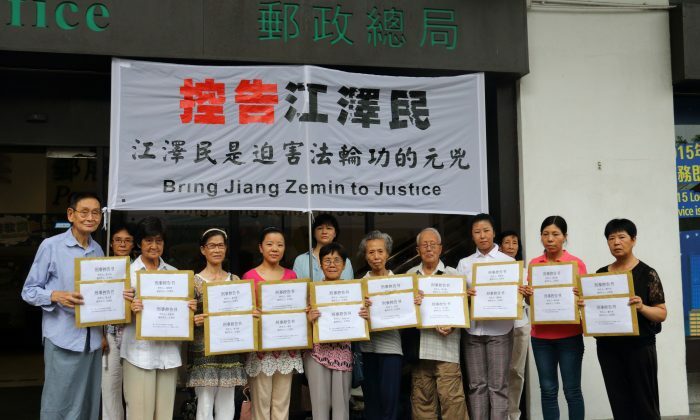 HONG KONG—At least 14 Falun Gong practitioners from Hong Kong have joined the wave of lawsuits against former Chinese Communist Party leader Jiang Zemin that began in May this year. More than 80,000 people in China and around the world have filed criminal complaints against Jiang since the end of May, according to the website Minghui.org, which monitors and reports on the persecution of Falun Gong. The lawsuits are filed by Falun Gong practitioners and other citizens who wish to bring Jiang to justice for launching the fierce persecution against Falun Gong in 1999. Fourteen people from Hong Kong have mailed in their complaints to China’s Supreme People’s Court and the Supreme People’s Procuratorate. These Falun Gong practitioners are from 30 to 70 years old and from all walks of life: the scientific community, the educational sector, business, retirees, and housewives. Seventy-nine year-old Falun Gong practitioner Mr. Hu Zijiao is one of those who sued Jiang. Mr. Hu is from Shanghai and was a senior computer science engineer. He made outstanding achievements in science and technology. In order to serve the country, he gave up the opportunity to work in the United States and Australia. She was then illegally arrested by police and detained in prison for several months. The police also raided their home. In 2005, his wife was tortured to death by the “610 Office,” an extralegal Communist Party organization Jiang created to oppress Falun Gong. Mr. Hu accused Jiang of ruining his family. “The wave of lawsuits against Jiang is significant, because Jiang brought the disaster to the country and everyone, and so many Falun Gong practitioners have been persecuted to death,” Mr. Hu said. “Shanghai has also been badly hit by him; almost all the practitioners have been persecuted. Fu Xueying, a practitioner in her 30s, began practicing Falun Gong in 1996 in Northeast China before moving to Shenzhen. She was illegally arrested in 2003 while distributing DVDs that debunked Party propaganda. Ms. Fu was illegally detained in the First Detention Center in Shenzhen City’s Nanshan District for six months and 12 days. On May 13, 2004, she was secretly sent to Guangdong Province Women’s Prison, where she suffered severe physical and mental torture. Three full years of detention left Ms. Fu with unforgettable physical and mental damage and haunting experiences. “What hurts the most is the threat to my family. They also often threatened to not let me out, or to increase the prison punishment. Every day I was living in solitary confinement,” she said. On June 28, 2007, Ms. Fu and another Falun Gong practitioner, Zhu Keming, lodged lawsuits against Jiang Zemin to the court in Hong Kong. They accused Jiang of torture, illegal imprisonment, and other crimes. Now Ms. Fu has filed the case again, and she believes it is of great significance. Ms. Fu called on all Chinese to know about Jiang’s persecution against everyone. “Everyone can stand up and accuse him and sue him,” she said. “The fate of Jiang’s followers is shameful and miserable, like Wang Lijun, Bo Xilai, Li Dongsheng, Zhou Yongkang, and others. They have all gotten involved in the persecution of Falun Gong practitioners.” Bo Xilai was the Party secretary for the megacity Chongqing and Wang Lijun was his police chief; Li Dongsheng was the head of the 610 Office; Zhou Yongkang was the former head of China’s security agencies. Yang Xiaolan, an over 40-year-old from Sichuan Province, used to suffer from asthma, bronchitis, and other diseases. After she began to practice Falun Gong in March 1999, her health improved rapidly. After the crackdown started, she went to Beijing several times to explain the truth about Falun Gong and the persecution. In November 2000, she went to Shunde City to distribute materials that told the facts about Falun Gong, and she was arrested by local police. 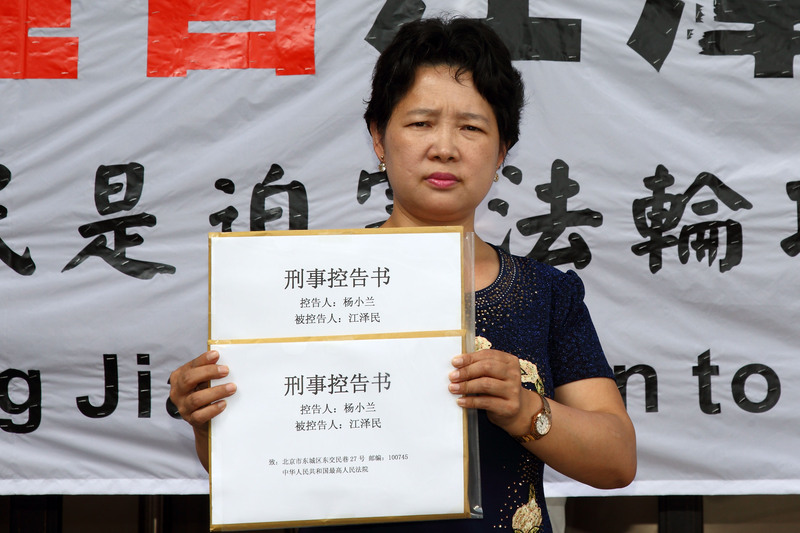 Ms. Yang was sentenced to two years and illegally detained at Guangdong Sanshui Women’s Labor Camp, after which she was detained and arrested illegally many times and was subjected to brutal torture. “Transforming” refers to attempting to force practitioners to give up their belief in Falun Gong. 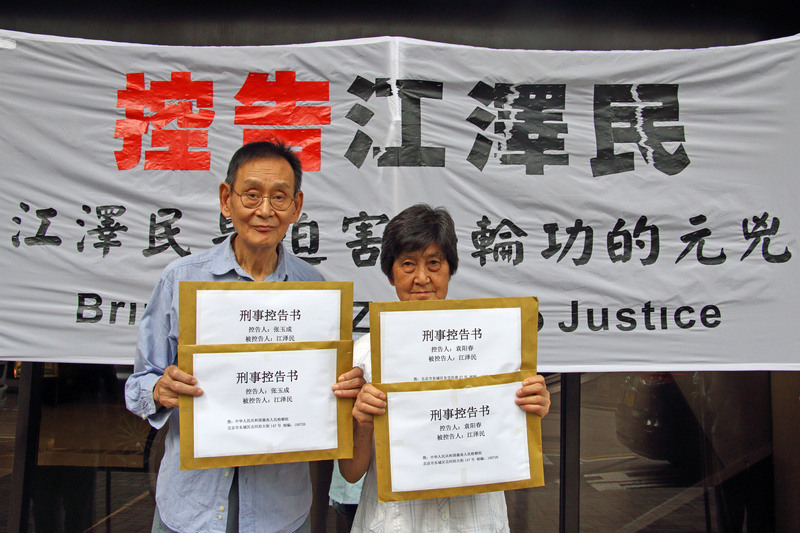 Yuan Yangchun, 75, and her husband, Zhang Yucheng, filed their lawsuit against Jiang together. Both of them used to have poor health, but they regained their health after practicing Falun Gong. Since the persecution began, Ms. Yuan has been illegally arrested, detained, and imprisoned five times. She said the case against Jiang is to expose his crimes to the world. She said the wave of lawsuits against Jiang is magnificent. A secretly recorded phone call by an investigative group may shed light on whether a former leader of the Chinese Communist Party directly ordered a genocide.